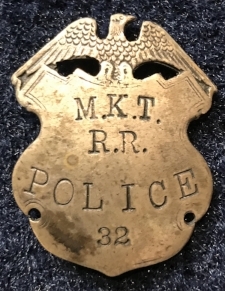 Lehigh Valley Railroad Police Badge #123. Early 1918 United States Railroad Association badge used during WWI. Lehigh Valley Railroad Police Captain's Badge and hat piece. Louisville and Nashville Railroad Police Sergeant's Badge. Los Angeles Union Station Railroad Police Retired Badge. Los Angeles Union Passenger Terminal Railroad Guard Badge. Metro Transit Police Maryland/Virginia 2013 Inauguration Issue. Missouri Pacific Railroad lines State of Texas Badge #5. Missouri Pacific Railroad Police Badge #12. Missouri Pacific Railroad used by the US Government for those protecting tunnels and bridges during World War I.
Missouri Pacific Railroad Police Special Officer Badge #17. Missouri Pacific Railroad Railroad Police Detective Badge #2. 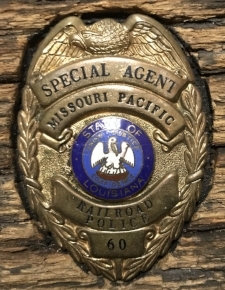 Missouri Pacific Railroad Police Badge #60 with State of Louisiana Seal. Montana Central Railway Special Police Badge. Morristown & Erie Railroad Police Asst. to the Chief Wallet Badge #102. Morristown & Erie Railway Police Special Agent Badge 105. 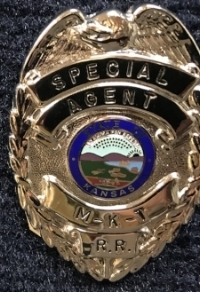 The first issue Special Agent Badge in 2004. Napa Valley Railroad Police Badge #3 with State of California seal. Napa Valley Railroad Police Chief Badge with State of California seal. 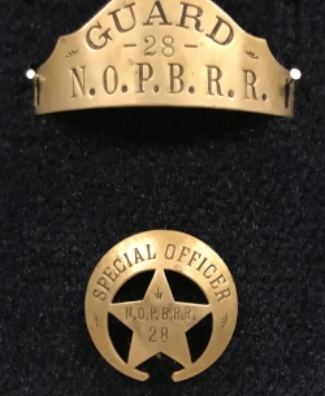 New Orleans Public Belt Railroad Special Officer Badge #28 and hat piece worn by Special Agent August Canton Sager. He was with the NOPB from October 1956 to retirement in 1973. New York Central Railroad Police Badge #887. Worn during the 1920's. Northern Pacific Railway Inspector Badge. 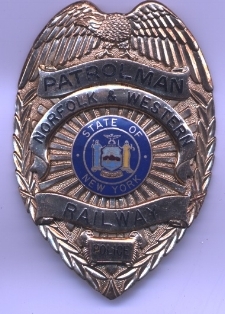 Norfolk And Western Railway Patrolman Badge with State of New York Seal. Last issue worn during the 1980's in the Buffalo, NY area. Northwestern Pacific Railroad Co. D-19-C Badge. 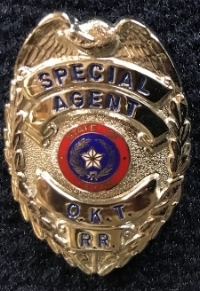 Oklahoma, Kansas and Texas Railroad Police Badge. Oregon Short Line & Southern Pacific Railroad Police Badge with diamond in the middle. Worn by Chief Special Agent Joseph Jones. Chief Jones worked for both railroads in the 1900's and was Chairman of the Railway Special Agent and Police Association Convention held in Salt Lake City, Utah in 1913. It is believed that he was presented with this badge for the work he did arranging the convention that year. 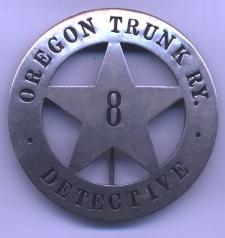 Oregon Trunk Railway Police Detective Badge #8. Worn during the 1900's. Penn Central Railroad Police Sargeant #610 Badge. Worn in the 1970's in the New York City area. Penn Central Railroad Police Superintendent Badge. Worn in the 1970's in the New York City area. Penn'A Railroad Police #341 Badge. Worn in the 1900's. 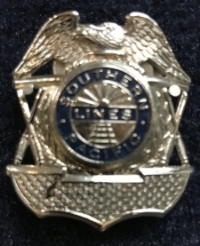 Pennsylvania Lines Railway Police #646 Badge. Pinkerton National Detective Agency replica badge. Even though these badges were not specific to the railroad, Allen Pinkerton worked for several railroads in the early days when they did not have detectives and needed cases investigated. Allen Pinkerton is at times mentioned as the "Father of the Railroad Police". Pinkerton's Protective Patrol Badge #446. Pittsburg and Lake Erie Railroad Police Sergeant Badge with New York Central Lines seal. Pittsburg & Lake Erie Police Badge #9 assigned to the Maintenance of Way Dept. Worn during the 1920's. Ry. Express Agy. Polcie Badge #306. The Railway Express Agency (REA) was a national monopoly set up by the United States federal government in 1917. Rail express services provided small package and parcel transportation using the extant railroad infrastructure much as UPS functions today using the road system. 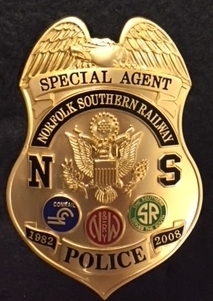 Railway Express Special Agent Badge. Rio Grande Railroad Police Special Agent Badge #22. Rio Grande Railroad Special Agent Badge with name C.B. Leonard and Badge #1265. 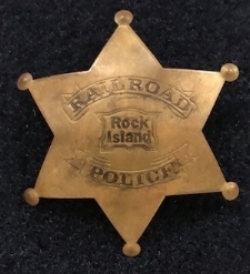 Rock Island Railroad Police Badge worn during World War I era by those protecting tunnels and bridges. 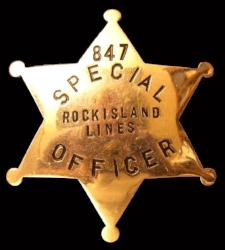 Rock Island Special Officer Badge #847 worn during World War I era by those protecting tunnels and bridges. These badges were issued to regular Railroad Police by the United States Railroad Association as a late attempt to unify all the railroad police under the federal government. It lasted only a short time. When the war was over this attempt dissolved and the railroads were back to retaining their independence. Gold Metal issued to attendees at the 1900 Salt Lake City general convention of the Railroad Agent and Police. Santa Fe Railroad Special Officer Deputy Sheriff's Badge. 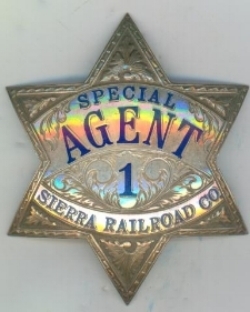 Sierra Railroad Co. Special Agent Badge #1. Made of sterling silver. Oldest known Southern Railway Badge #1. 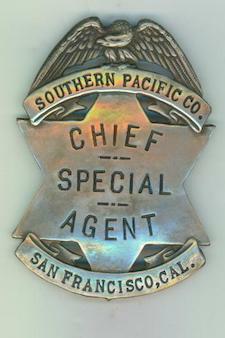 Chief Special Agent Southern Pacific San Francisco badge (6 point star with eagle top) belonging to the legendary Chief Dan O'Connell. June 1955, W. Beaumont PD, Auxiliary Officer, Beaumont, TX. Badges SP 729 and SP 13 were two Southern Pacific Badges worn by Special Agent Bill Teel during the 1950's era. This design was later changed in 1988. The first issue Southern Pacific & Steamboat star #1. This badge is a massive 5" across. 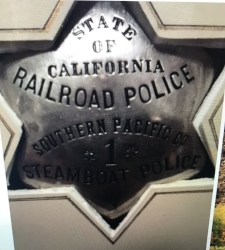 Southern Pacific Railroad Police State of California Steamboat Police Badge #432. 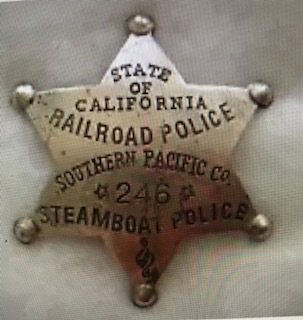 Southern Pacific Railroad Police State of California Steamboat Police Badge #246. Very rare 1900's Southern Pacific badge known as a "Little Jefe", "Little Jeff", and Little Chief"
The word "Jefe" is Spanish for Chief. A group of early sterling Southern Pacific Chief's stars with solid 14K gold numbers.